Take a trip down memory lane with this easy version of a classic British treat. It needs no cooking and is perfect for a summer fête or home-made gift. Line a 24cm square tin with baking parchment. Mix the condensed milk with the coconut, icing sugar and vanilla extract until thoroughly combined. Spoon half of the mixture in the base of the tin and spread out evenly with the back of a spoon. Add the food colouring to the remaining mixture and blend well until it is an even pink colour. Spread over the top of the first layer and smooth out. Leave overnight, or at least for 4-5 hours, in a cool place before cutting into squares. This recipe is a simplified version of the original in which sugar is boiled to a high temperature. 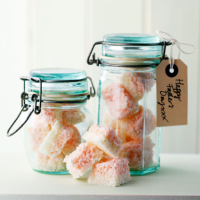 If you are able to leave the coconut ice overnight it will dry out and give a more traditional, crumbly texture.For a simple gift idea, place some of the coconut ice in attractive airtight jars and attach a gift tag, or in squares of clear cellophane and tie with colourful ribbon.